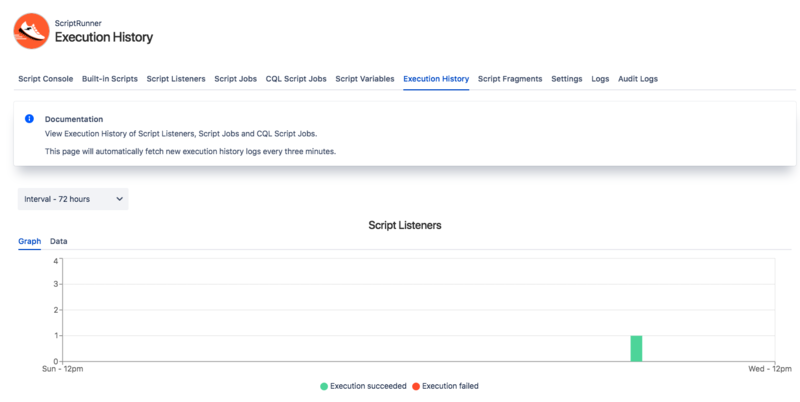 The Execution History page is a feature, which allows you to view all your script executions in a single page, presented either as a graph or a table. Viewing the graph will show if the script was executed successfully or had failed. Hovering over each bar will display a tooltip displaying the time run and a description of the script. Viewing in table mode will provide a more detailed analysis of the execution history of each script. All histories diplayed are from the previous 24 hour period and in graph view each segment represents a 30 minute block.